ScanDigital.com. Check out this article from Danny Brown over at EasyReader. Many people dream of making their first million before they are 30. 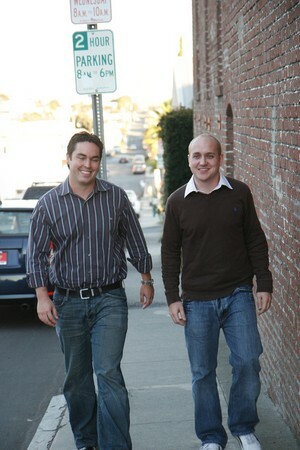 For lifelong Manhattan Beach local Mike Mothner, 27 and Santa Monica resident Anderson Schoenrock, 28, the dream was already old news when they sat down last spring to collaborate on an empire in the uncharted digital world.â€œI was eating Christmas dinner with my family last year when my mom, who had just got her digital camera, asked me how she could get all the old photos into the computer,â€ recalled Mothner. “The light bulb went off. It would be a time consuming task and I ran upstairs and checked online to see if other people were doing it.” Mothner pitched the idea of converting photographs, negatives and slides to Schoenrock at a New Yearâ€™s party last year. The two met in 2001 when they were members of Dartmouth Universityâ€™s Psi Epsilon and made vague plans to one day work together. They launched their new company last June. The start up money for ScanDigital came from Mothnerâ€™s Wpromote.com, an online marketing agency that achieved approximately $6 in revenue in 2007. Inc. 500 ranked Wpromote as the 62nd fastest growing private company in the United States. Mothner began the company from his dorm room during his freshman year at Dartmouth. During the peak of the dotcom boom, he worked as an intern for Red Point Ventures, reading business plans. This was before Google had become a household word and there was an array of different search engines sprouting up. Reading through the plans, Mothner noticed a pattern: the companies all had websites and needed to find a way to increase their visibility online. Mothner began programming while a student at Pacific Elementary. When he was 14 he wrote a basic calendar program that was like a simpler version of Microsoft Outlook. Mothner ran Wpromote throughout college, where he pursued a double major in Computer Science and Economics. For $9.95 a month, the program alerted the different search engines about a new website and indexed it, a process that would otherwise take two days of work. The company caught the eye of people working at Google. The Web conglomerate and Mothner formed a relationship that has since given Mothner a powerful ally in the cyber realm. Mothner was working as the fulltime CEO of his college start-up company when he approached Schoenrock with the idea for ScanDigital. Schoenrock, who graduating two years before Mothner, had landed an investment banking job on Wall Street. At 25, he and a Wall Street colleague started a boutique real estate firm. The firm completed a number of high profile transactions, including the sale of the Union Bank Plaza Tower in downtown Los Angeles for $143 million. When Mothner approached Schoenrock, the boutique real estate company controlled $600 million of real estate property. But Schoenrock was sensing that the real estate boom was nearing its end. I looked through the site and like the idea. My concern would be trying to convince my parents why they should part with their (arguably unique) photo albums by way of sending them off to some company they’ve never done business with before. I’m not sure what the solution to that concern is, but thought I would just bring it up here. Maybe one of the other readers here have some ideas on how it can be addressed. The success is great and to know I had similar ideas about 4 yrs ago lets me know where I stand in this innovative time and age. When I had my photo collage business at the mall I would offer a photo archiving service on CD. Before I would do my artwork. I was scanning in all the customers photos and placing them in High Res. on CD. I wanted to eventually market it to Insurance companies as service to offer their customers to do in case of fires and floods etc. I did this for all of my customers, it is an excellent idea. Happy to see it taken to the next level and wish them all the better with it. Thanks for your comments. I’ve contacted my brother and I’ll let him tackle some of your questions. Thanks for reading and contributing to the conversation.